With a smooth texture and delicate taste, white chocolate pairs so perfectly with so many unique and exotic flavors. While an irresistible creamy indulgence on its own, the light and fresh qualities of white chocolate complement even the most viscous and bold tastes like tart berries and citrus. 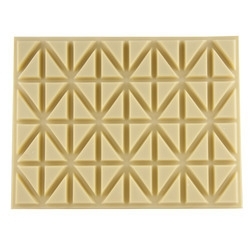 Royal Wholesale Chocolate allows you to buy blocks of Merckens white chocolate in bulk, so you can snack, cook and mix them into any unique recipe. We invite you to experience the fresh and creamy goodness of all our Merckens white chocolates. Their chocolate coatings are a simple and easy way to enhance any dessert with an easy-to-melt quality that creates a crisp, flavorful shell or a soft, glossy glaze. Royal Wholesale makes ordering and reordering Merckens white chocolate quick and easy, so you can enjoy this sweet addition to your ice cream, scones, cookies and more. We believe everything tastes better covered in chocolate, so make sure you’re cooking with the very best.